Stitched, rounded pocket: Almost always used as front pockets, these usually appear in pairs, stay flat on the body, and have a row or two of topstitching on the inside edge. The right front pocket on a pair of jeans often includes a little coin pocket peeking out above the opening. Back pocket: Back pockets go on the back of pants, especially jeans. Back pockets feature a flat topstitched pattern of some sort and lay flat on the body. 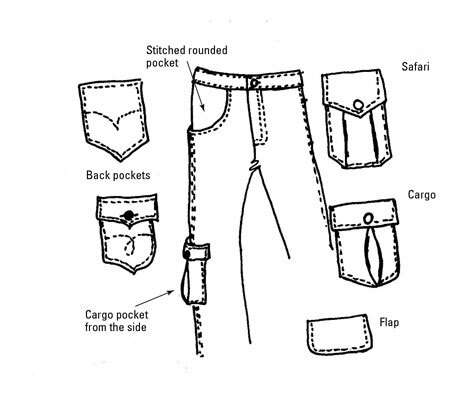 Safari pocket: Safari pockets, which you generally see in men’s pants, have a flap on top, a button or snap closure, folded fabric (or pleats, indicated by the two vertical lines) to give extra room in the pocket, and topstitching around the perimeter to attach the pockets to the pants. They’re not flat, and from the side, the safari pocket looks similar to the cargo pocket. The safari pocket is often found on the side of men’s pants. Cargo pocket: Cargo pockets are popular in men’s pants and have made their way onto women’s pants as well. They feature a rounded fold in the body, a flap with a button or snap (sometimes invisible under the flap), and topstitching around the perimeter. They’re usually located on the sides or back of the pants. Flap pocket: Flap refers to a piece of material that covers the opening on the pocket. A flap can be paired with any type of pocket that doesn’t already include a flap as part of its design, thus creating a flap pocket. Flap pockets usually include a button or snap to keep the flap closed. Side-seam pocket: A side seam pocket is generally invisible from the outside of the garment. It’s visible simply as a slit in the side seam. You may see topstitching around the pocket on the seam line.